These are pictures from Audra’s room (7 years old then). 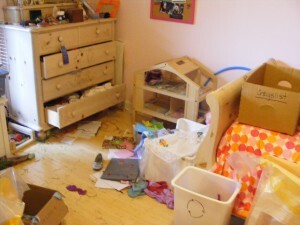 Her room had gotten so bad, that I felt overwhelmed by the sight of it. I’m sure she did to. 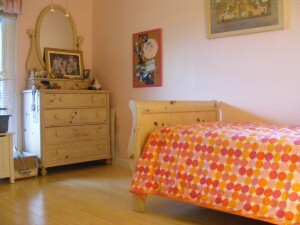 The room was decluttered and cleaned in 3 hours by myself and a decluttering professional. (Yes, I was so afraid, I had to call in the big guns.) Since then, Audra and I have decluttered much, much more; it’s a lot easier when everything can be seen. It is easy to see from these shots the advantages to decluttering. It is now much easier for Audra and Cindy to keep things under control in this room simply because there is less to control. fab photos – thank you for sharing. It really motivates and inspires to see what others have achieved. Thanks Mrs. Green. It was pretty terrifying, I must tell you, in this case, having help really made the job easier and less genuinely overwhelming. Today’s mini mission was to clean out one hanging file. I started to clean out mine on Monday and I kept going through my papers until I had all my folders organized. I started with seven binders and now I only have three. It was pretty exhausting to work with the papers every night after work, but I’m so pleased with the result. Mini mission turned into a mega mission, but it was well worth it. Great pictures Cindy! What a lovely room! Thank you Anne. Both of the girls have beautiful rooms that really reflect their personalities, but like the little girl with the curl in the middle of her forehead, when they are bad, they are very, very bad. thank you so much for remembering and just so you know I am having a nice relaxing day although it is going too fast. I want this day to last. I am glad to see you are still managing to turn the mini missions into mega missions and achieving more than you set out to do. My evil yet cunning plan is still working. Anne, you’re making some of us look bad, you over-achiever you! No, seriously, you are doing wonderfully. Seven binders to three is amazing. I need to do that too. My bedroom looks horrible, my closets hate me… Do you have any tips for young-adults/students who only live in one room (studio etc.)? We can’t get everything out of one room! welcome to 365lessthings I get especially excited when young people take an interest in my blog because now is the time to form good habits. Be it organising or spending if you learn now to keep these two areas of your life in check then you will find life will run more smoothly into the future. You know I think this topic deserves a post of it’s own so stay tuned and I will try to put one together in the next week or so. Thanks for the idea. In the meantime clear out the stuff you know you don’t want and take heed of the hints I have already given to you and let me know if you see any improvement. Just remember you don’t have to do it all at once just one area a day, one bag of stuff gone a day or one item if that is all you have time for but just get started and eventually you will notice the weight lifting of clutter lifting away. That was AWESOME advise! Yes, please, Nurchamiel, take this advise completely seriously! This is the most awesome place/post available for decluttering, and Colleen (and her guest writers, Cindy…) have experience, and tell it for what it is worth. I can totally feel through this post a lot of frustration and burden because of the current lifestyle you inhibit in the small living space – so PLEASE start slowly, or go all out, but DO IT. It WILL change your life! thanks for that vote of confidence in my advice. Having a 21 year old daughter (who is “somewhat” disorganised) puts me in the position of speaking from experience. Colleen gave a mighty full answer to that question, and I have a short one to add to it: shelving. I was recently in a tiny one bedroom apartment shared by two people. While they didn’t have a lot of stuff, they had absolutely no shelving or storage, so many things were piled in the corners. Without using the vertical space, it’s hard to make good use of a tiny area. Good advice. IKea is a great place to buy cheap yet attractive shelving. BUT ONLY IF YOU NEED IT! If you declutter and minimalise and simplify, YOU MIGHT NOT NEED IT (but I agree w/ Cindy’s comment, DON’T store/shove stuff into corners. That is totally blocking the freedom you need in your lifestyle right now!). Good point. Don’t store/shove stuff anywhere for that matter. Anything that you don’t feel the need to take care of properly is obviously excess to your needs or you would afford it the care it requires. When it all boils down to it, it takes very little “stuff” to get by in life and all the added extras can sometimes just become hard work unless you neglect it and if that is the case you don’t need it. Thank you all for your wonderful replies. Yes, I will definitely (did I spelled that correct? Lol, English is not my native language) start. I will be looking forward to your post, Colleen (I am following your blog much earlier, but I haven’t posted before). That reward-system sounds good, but I think I will try to do it without the system, because a tidy room is already a reward on it’s own. I think I will get myself some sort of alarm (perhaps on my phone or so, I love multitaskers) so that I will declutter for 15 minutes a day or so. Thanks also for the idea of shelves. I currently have a big bureau with build in shelves (yeah, sound weird eh?) but I might move to another place in the future and it will not go with me. Then some shelving could help me. I am so glad you are willing to do the work to clean up your room without a reward system. That makes me feel that you are dedicated to the mission. I like the idea of putting an alarm on your phone to remind you to do 15 minutes of decluttering a day. I so look forward to hearing about the end result of your efforts. Good luck and happy decluttering. Happy Birthday Colleen – hope you had a very special day:) *cheers and waves*!!! **Copy message to all blogfriends -I’m locked out of magicalmeadows by Blogger because I messed up my passwords. If I can’t rectify it today looks like I’ll have to start up a new blog *sigh* right when I’m at my busiest. In the meantime you can email me if needs be on ms_pam_ella@hotmail.com. ** End message. I am having a lovely day and I thank you for your kind wishes. I am taking it easy which is more of a mind set than physical but as women we all know how that works. I hope you get your password problems sorted out so you can continue on with your blog. I went over to have a look and was inspired by your TRY attitude to start a post on it, so thank you and hopefully when I link to your blog you will be up and running again. 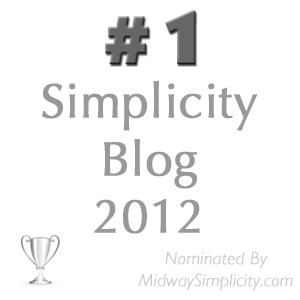 If not please send me your new blog address. Sorry, no. Colleen and I have never met. She lives in Australia and I live in the United States. I used Susan, one of the very helpful employees at The Clutter Consultants here in Austin, TX. Oops, of course – I should have realised it couldn’t have been Colleen! Cindy, can you tell us a bit about how the clutter was disposed of – how much kept, how much gone, and how your daughter accepted the process (and the disposals)? We had four bins/boxes: recycling, trash, thrift store, and hand-me-downs, which go to the girl across the street, plus a dust rug (microfiber, of course! ), broom and dust pan. 1. There was probably 1/2 a small bag of trash – mostly craft projects whose time had come…and gone, although I pulled reuseable pieces off, and those went to the art closet. 2. There was A LOT of recycling, because Audra is very attracted to paper. 3. The hand-me-down box probably only got a few things. 4. There was probably one box for the thrift store – mostly trinkety junk that kids are so attracted to. I waited until Audra was with me to make a lot of larger decisions. The first time she went through her books, for example, she eliminated 55 of them. In addition, Audra likes rocks, as does Susan who was helping me. At my request, Susan winnowed down the rock collection by at least half, and those went out in the side yard to join their rocky friends. 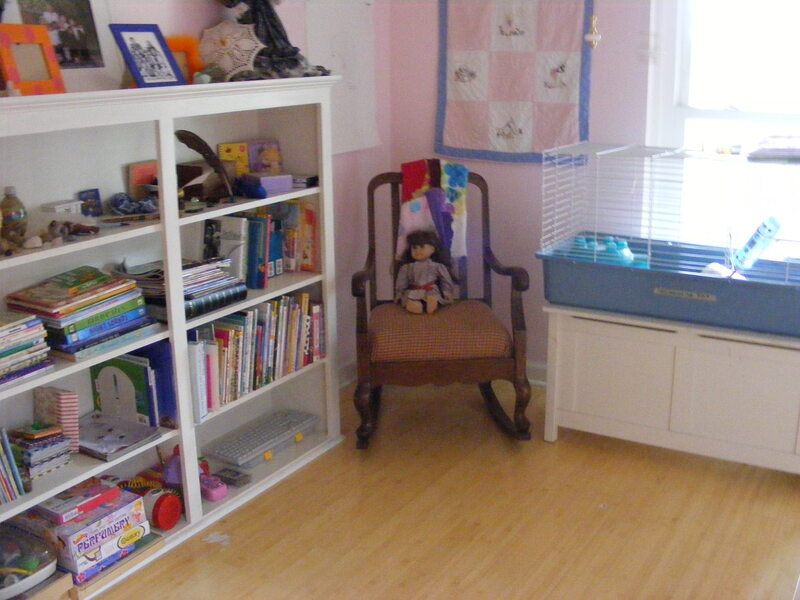 There were also a lot of things that simply did not belong in Audra’s room, and those things got rehomed. Audra was thrilled! Clara was somewhat envious and with the help of a friend and Audra immediately set out to declutter her own room. I have some cute pictures of the three of them surrounded by Clara’s books evaluating them. Cute reaction from your daughter! I wish my mom would come and surprise me too, and I’m way older than her! May all your birthday dreams come truuue! May it always be decluttered toooo! Love the birthday song Jo! thank you for the birthday wishes and the wonderful song and remembering a day in advance so you were on the right day for me. My daughter phoned from the bus on her way to work today and I said “aren’t you going to sing to me, she said “I’m on the bus” my response way “SO!”. She didn’t sing. Ahhh, I just noticed Anne was the first to wish you Happy Birthday, so I should have been handing out thank yous to her for the reminder also . . . Happy Birthday Colleen! I suppose you’ve already gone to bed over there and down under, but I’m thinking happy birthday thoughts anyway! One way to delcutter a studio apt/one room area might be to just start in one corner and declutter what’s there and work your way around the room keeping the sections you’ve worked on clean and uncluttered. Thank you for the birthday wishes. It is only 12:15 in the middle of the day so you aren’t late at all. I’ve been out for a yummy breakfast, about to have figs for lunch and am booked in for a delicious dinner. Life is all about food, in moderation of course. Figs are the best, aren’t they? Haven’t seen any in the shops down here yet though. Cindy, the before and after photos are inspiring! I’ve decluttered my 10 yo daughter’s room at least 5 times in the last year (mainly with her help) and finally we’ve got it to a manageable standard. Just having much less stuff is so much easier for her to deal with, and she has a TINY room. thanks for the wishes and I did blow out on the food but it was gooooooooooood! 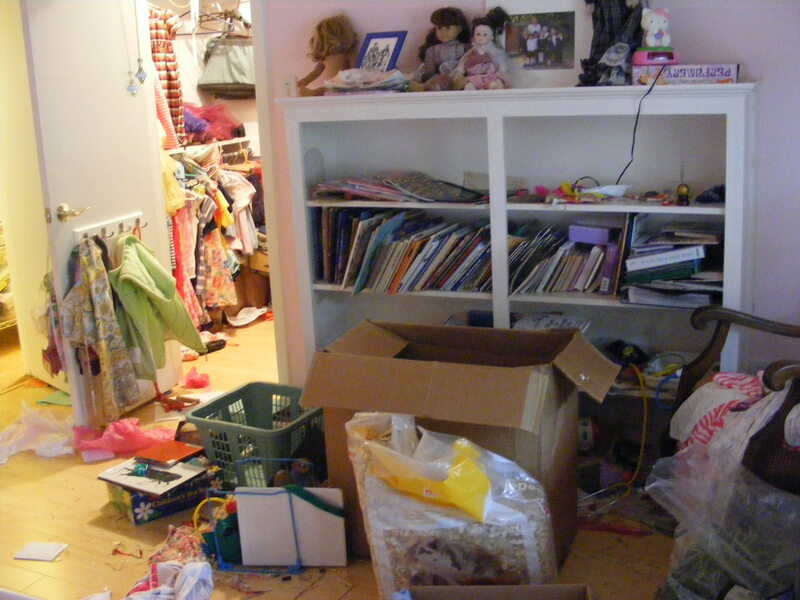 Isn’t it funny how whenever we talk about decluttering children’s bedrooms they always seem to be girl’s rooms. Anyone have any thoughts on why that is? I think girls tend to have more “little” items and oftentimes more books. By little items, I mean small, intricate toys (eg Polly Pocket), and stuffed animals, crafts, and hair items. The small toys might be because of the tendency for girls to be less boisterous in their play and have more advanced fine motor skills. Just my observations from the girls and boys I have known. you could be right. I was lucky with Liam he was fun loving and playful but not so rough and tumble as most boys (probably because his sister beat him into submission) so it was hard to tell the difference between my two in that respect. However I do think girls are easily lured buy shine and pretty things and they tend to hold their interest for shorter periods. Boys can return to their Lego set over and over and make something different every time so it stays interesting. thank you for the birthday wishes and welcome to 365lessthings.com. Now that you have broken the ice and left your first comment maybe you will drop in more often. We look forward to hearing more from you. Happy Birthday! And thanks so much for your inspiration! thank you and it is my pleasure to help. Happy birthday, Colleen! As it happens, I bought a much-needed bookshelf yesterday so as to transfer the mountain of books from my son’s floor to the bookshelf, so now he has a floor again. Fun to think I got so much tidying done on your birthday — very appropriate! My daughter even got into the act and tidied her own bookshelf, eliminating about 8 books along the way. Hope you have a lovely and clutter-free birthday. thank you very much and I did have a clutter free birthday. My son bought me a tiny little fine tip applicator for my crafting, my hubby and I went out to dinner (no gift), my daughter got me nothing as instructed, the rest of my family honour my wishes and don’t exchange gifts for birthdays and Christmas and I received 4 figs and a natural fibre loofah (which I needed badly) from a good friend. So as you see it is possible to convince those you love not to shower you with unwanted gifts and still feel loved. I received lots of wonderful wishes via cards, facebook messages, phone calls and blog comments. It was a lovely birthday. Isn’t it lovely when friends and family cooperate with the gift thing? We did that this past Christmas and it was a big relief and it was also one of the better Christmases! It had the effect of putting the focus solely on the good wishes to each other and just enjoying the time together on that particular day, without any focus on the suitability or inadequacy of the stuff, or expectations met or unmet. Marvelous thing, that. thank you for the birthday wishes. It was a lovely day. As you say celebrating an occasion is not diminished by the omission of gifts it actually enhances the joy of being together. OMG!!!!!!!!!!! 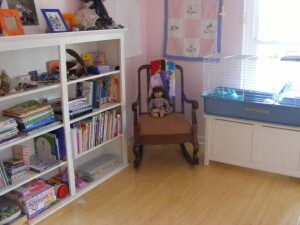 The after photos show a PICTURE PERFEKT absolutely DARLING room! This room is truly like one I’d find in a decorators magazine! WOW! I hope Audra (byw, LOVE her name!) feels better, sleeps better, continues to CLEAN UP after play/activities, etc. That is SOOO awesome. It’s like an entirely new ‘energized with a sense of calm’ space. I’d LOVE that room for my little girl (ahumm, the ‘after’ photos, of course!). Cindy, you are so wonderful to bring in a DECLUTTERING/ORGANISING expert. That was the best idea of all, because sometimes our own family members are the TOUGHEST clients we have in this minimalism/simplicity/decluttering life style! I recommend a visit to Bamberg if any of you are in the Germany area. There are so many awesome places in this country, that is just one of many, but a bit off the beaten path, and lovely to see! thanks for the birthday wishes better late than never and birthdays are even better when they get spread out over several days. Not having to resist temptation, that is good yes yes! I look forward to going to Germany again. I have been to Rothenburg, Ulm, Dachau, Berlin, Munchen but look forward to seeing more. I love the food there. oo, guilty guilty guilty! i think i should photograph my room before-and-after…though currently there is no after! i hope she finds it easier to keep tidy now! i have always been a messy person so I hope decluttering will make being messy a bit harder! it actually wastes less of your time by staying tidy than it does being messy. Eventually you have to have a bit of a clean up which takes time but in the meantime it takes longer to find anything because of the mess. You are right though it does make it easier to be tidy when you have less stuff.